Size of Peregrine but resembles Saker in plumage and shape; long wings with ample hand, slightly blunt-ended when soaring; tail relatively long. Adult separated from most Sakers by barred, greyish upperparts, including distinctly barred uppertail, more contrasting head-pattern of black upper-forehead band, clear-cut narrow black eye-stripe, always conspicuous moustache and with crown unstreaked creamy buff, chestnut or pale rufous; also some spot-bars on flanks. Juvenile very like young Saker (dark brown above, including head, boldly streaked underparts and rear underwing-coverts, contrasting with pale flight-feathers) but has unbarred closed uppertail (unlike most Sakers). 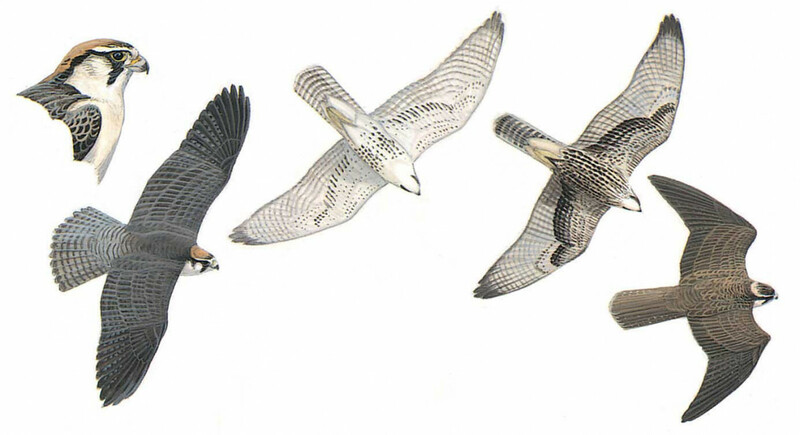 The contrasting underwing pattern and, sometimes more densely streaked underparts, separates it from similar Peregrine and Barbary. Active flight with moderately slow, stiff wing-beats, faster when hunting; stoops or runs down prey. Soars with wings level or slightly upcurved.